I travelled 15 hours in a van to territory held by the Tamil Tigers in eastern Sri Lanka only to have Wordsworth quoted at me by the rebels. It ranks as one of the most surreal moments of my life. There we were surrounded by men armed to the teeth in a vast rebel military camp. A man who had never seen a daffodil in his life was reciting "I wandered lonely as a cloud" and telling me how "a host of golden daffodils" evoked for him the beauty of his native landscape in eastern Sri Lanka. The Wordsworth fan, Varathan, is clearly a closet romantic but you would not know it from his appearance. He is the translator for Colonel Karuna, the Tigers' number two who suddenly broke away last week, taking with him some of the thousands of men and women under his command. 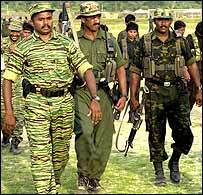 Colonel Karuna's actions have sparked the rebels' worst crisis in two decades of armed conflict for a separate Tamil homeland. Mr Varathan was still wearing dark glasses at twilight and was always by the side of his leader, the colonel, who must be the most endangered man in Sri Lanka. That is quite something in a country where suicide bombers have killed a president, a prime minister and hundreds more. Finding Colonel Karuna required hours of travel on bumpy roads. At times I thought the rebels were deliberately driving us round in circles. We were escorted by two pick-up trucks and a van full of heavily armed men wearing ammunition-laden jackets. As they sped down the dirt tracks the rebels were enveloped in dust as we trailed behind. We were unable to keep up with the pace in our vehicles, one of which broke down halfway there. We left the driver in the middle of a Tiger high security zone to fix the vehicle - only later did we wonder how he would feel as a member of the majority Sinhalese community deep in enemy territory. But we should not have worried; he found someone who spoke his language. When we retrieved him in the jungle after nightfall he told us Colonel Karuna's men had filled him in on the latest news - and we wondered if he had developed better sources than us. I last met Colonel Karuna in a resort hotel in Thailand during peace talks with the Sri Lankan government. At the time he was wearing a suit and looking the part of a politician. In fact he had even quizzed me about why the BBC continued to describe the Tamil Tigers as rebels now that they were involved in peace negotiations to end the war. This time I told him he had earned the title of rebel twice over - rebelling first against the Sri Lankan state and now against his own movement. Dressed in the Tigers' stripy military fatigues and cap, Colonel Karuna inspected a parade of his troops. The idea was to show us he was in charge of the Tigers' sizeable eastern forces. Women fighters carrying Kalashnikov rifles marched to the drum beat - and then performed drills with mortars and heavy artillery alongside their male comrades. This was the first time I had been to a large scale Tiger camp - the northern leadership had shown us training and live-firing exercises but never jeopardised the security of their major bases. 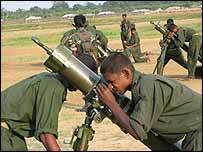 This camp was the largest in the east of Sri Lanka - a vast ground surrounded by hundreds of barrack buildings. 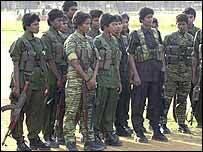 Colonel Karuna said it was home to 5,000 rebel fighters - 2,000 of them women. The breakaway commander even joked that this was a show meant for the Tigers in the north. They have expelled him as a traitor and dismissed him as a lone individual with no supporters. He says he broke away to defend the rights of the people in the east, whom he says were discriminated against by northern Tamils who dominate the rebel leadership. Although he has claimed suicide squads have already been dispatched to kill him, Colonel Karuna looked extremely confident. As a man who has had many bitter experiences while commanding major battles against the Sri Lankan army, he says he is not afraid of death. And he is not alone. Leaving his territory at night we were stopped at a checkpoint by a boy brandishing an assault rifle who could not have been more than 14 years old. He wanted to search all our equipment and saying we were from the BBC cut no ice. He did not seem to know what the BBC was. Only when we said we had interviewed his leader and had to rush the tape out did he relent. We were ordered to go as fast as possible.